June 23, 2016 2 comments on "Canning Spaghetti Sauce"
Canning spaghetti sauce is very satisfying. It does take a little work, but it is definitely worth the effort. 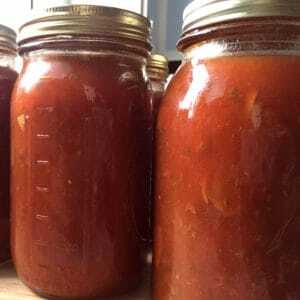 If you have gone to all the trouble to grow your own tomatoes, trying canning a few jars of spaghetti sauce to enjoy with your family this winter. To can homemade spaghetti sauce you will need a pressure canner. A boiling water canner doesn’t reach a high enough temperature to process the vegetables in the spaghetti sauce, so the canning jars must be processed in a pressure canner. The benefit of a pressure canner is that you can also use it as a boiling water canner, eliminating the need to have a separate boiling water canner. If you don’t have a pressure canner, you can easily freeze it in these inexpensive freezer containers you can order from Amazon. Once you have your homegrown tomatoes, pressure canner, and some canning jars, you are ready to get started making homemade spaghetti sauce. The measurements I will be listing are approximate. It is difficult to give precise measurements when tomatoes come in all different sizes, so just do your best to judge how many canning jars you will need. My tomatoes were small- to medium-sized. By following this recipe I was able to can 2 quart sized jars of homemade spaghetti sauce. Note: You can use any kind of tomatoes, just make sure that they do not have any blemishes or cracks. Only pick the best tomatoes for canning to avoid the possibility of bacteria growth. If you have never peeled tomatoes before, it is very easy. The key to peeling tomatoes is to dip them in boiling water for about 30 seconds to 1 minute, until the skins start to crack. I place them in the bottom of the pan and then remove them with tongs. Next dip them in cold water until you can handle them. The skins slip right off. It is best to keep a pan of boiling water on the stove while you are working. If you let the water cool while you are working, it will not be as effective in removing the skins. Gently squeeze the tomatoes into the sink or a bowl until all of the seeds and liquid are removed. A colander works well to catch the seeds. You might want to save some of the juice to top off the jars when you are pouring the sauce into the canning jars. As you finish removing the juice and seeds from the tomatoes, drop the tomatoes into the blender. When the blender is almost full, process the tomatoes until smooth, and then pour into a bowl. Continue until all of the tomatoes are seeded and processed. In a large stock pot over medium heat, cook the onion, green peppers, mushrooms, and garlic in the butter and olive oil until the onion softens, about 5 minutes. Pour in the processed tomatoes. Stir in basil and Italian seasoning. Bring to a boil, reduce heat, and simmer on low for about 2 hours to allow the flavors to blend. If a thicker sauce is desired, add tomato paste to desired consistency. Pack hot jars with hot spaghetti sauce leaving 1-inch head space. Wipe rim and screw threads and adjust lids and screw bands. Following manufacturer’s directions, process quart jars in pressure canner* for 25 minutes at 11 lbs pressure. Let your jars sit somewhere where they will not be disturbed for at least 24 hours to cool and finish the sealing process. 2 Comments on "Canning Spaghetti Sauce"
Hi! For pints it is still 11 lb. pressure and the time is 20 minutes.